In preparing to write my admission essays for rabbinical school at the Jewish Theological Seminary in the mid-1990s I read several books on Jewish theology. One book that helped me greatly in organizing my personal theology was "We Have Reason to Believe" by Rabbi Dr. Louis Jacobs. I worked through this book rather slowly, re-reading entire chapters and writing what would be the outline for one of my essays in the margins of the book. It has been fifty years since Rabbi Jacobs (left) wrote this monumental book and Rabbi Reuven Hammer's article in the Jerusalem Post explains why "We Have Reason to Believe" is such a revolutionary publication, as well as an important contribution to modern Jewish thought. Rabbi Elliot Cosgrove, a Conservative rabbi from Chicago, has been working on a doctoral dissertation about the life of Rabbi Louis Jacobs who died on July 1, 2006 (Shabbat). 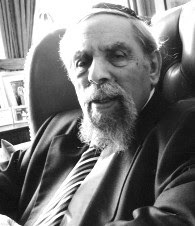 Rabbi Cosgrove delivered a beautiful memorial tribute on the occasion of Rabbi Jacobs's first yahrzeit and it is available on the New London Synagogue website. My friend and classmate, Rabbi Jeremy Gordon (right), was a student of Rabbi Louis Jacobs having grown up at the New London Synagogue. The synagogue website currently announces that "It is with considerable pleasure that the New London Synagogue announces the appointment of Rabbi Jeremy Gordon to the pulpit of the synagogue." Best of luck to Rabbi Jeremy and may you go from strength to strength... you have mighty big shoes to fill!